This article was translated into Russian. The PDP-11 had 12kw of memory and a number of 16kw bitmap frame buffers that could be mapped into the address space of the Unibus. The frame buffers generated a video signal that was used as input for a video switch configured by the PDP-11. The output of that video switch was fed into the TV sets which were used as terminals. For input there was a keyboard multiplexer to which the Knight keyboards were attached. The file . ; TV BIN can be loaded into the 11 from the 10 with the STUFF program, then the 10 and 11 communicate via shared memory. The Knight TV system was the preferred way to talk to ITS for a while so there was not question it had to be resurrected! Lars and I talked about how this multi-level design should be implemented. We had Rich's simh-based KA10 emulator to run ITS. The first question was whether to use simh to emulate the PDP-11 or write a new emulator. As I find simh code rather hard to read and because emulation is fun we decided it would all be new code. Also, since there is only one 11 but multiple displays/keyboards, the 11 would best run as a server to which clients then connect. This would also allow multiple people connected to the same remote system to spy on each other's consoles, an important feature. The idea was to have the 10 and 11 emulators run on the same machine and have TV clients connect from remote. Network connects are an easy way for processes to communicate so we decided to use a simple protocol to implement the 10-11 interface. Writing emulators is fun and especially in the case of the PDP-11/10 it's easy enough to be done in a couple of days. Since at first we thought it was a PDP-11/10 that was running the TV system, that's what I wrote an emulator for. It worked because the difference to an 11/20 isn't that great. I later modified the emulator to behave more like an 11/20 but the following describes how I wrote the first version. 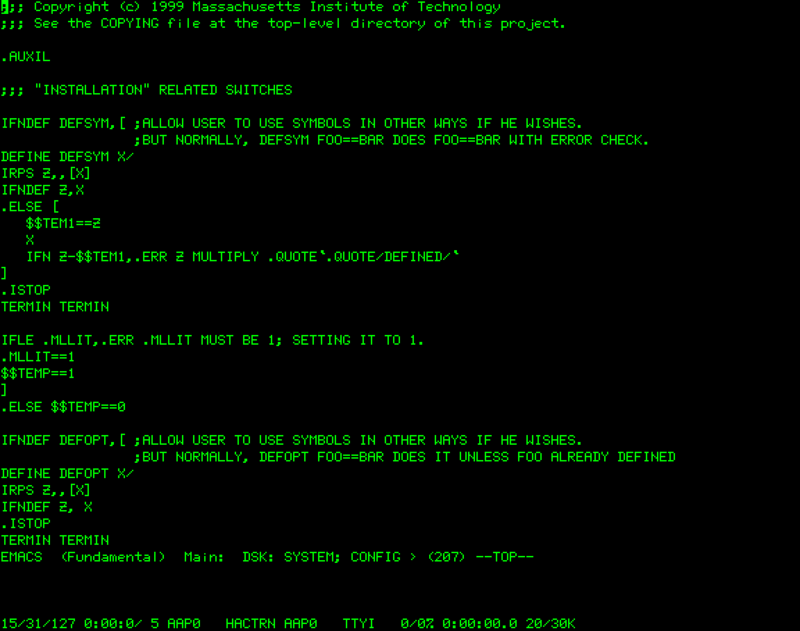 The PDP-11/10 is in fact the same model as the 11/05 and all relevant documentation can be found on bitsavers. It is a low-end model very similar to the original PDP-11/20: microcoded (unlike the 11/20), 16 bit address space, no extended instructions (multiply, divide, &c.). A couple of peripherals are included in the 11/05 as part of the CPU: a KW11 line clock look-alike, and a KL11-like TTY interface. Since it has no extended instructions, the MIT hackers equipped the TV 11 with the KE11 extended arithmetic module, a device that sits in the Unibus IO page and is controlled by writing values to a number of mapped registers. I considered writing a rather low level emulator that would actually execute the microcode but decided against it. 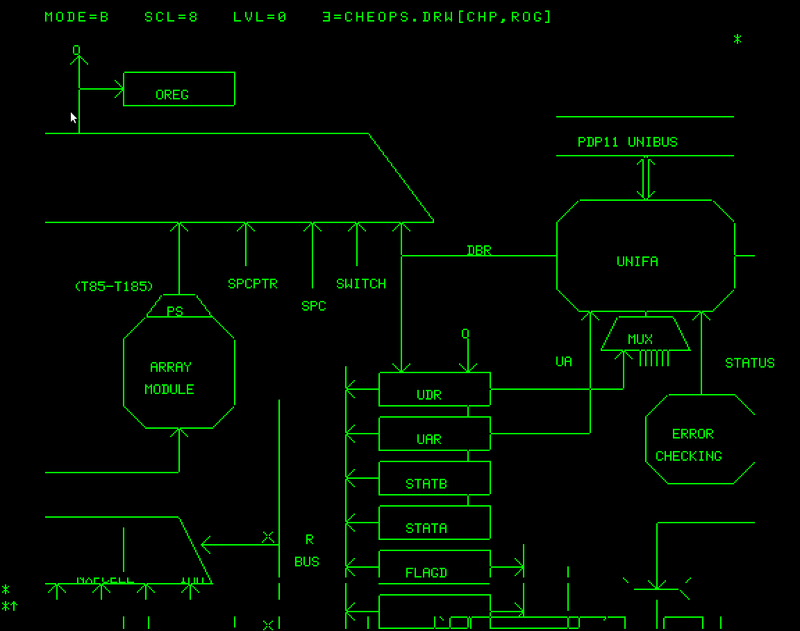 Instead I wrote some higher level code that was still inspired by the schematics and microcode. The emulator is written in C.
The internal devices do not use the Bus, they're handled by CPU code. For a given address a device which recognizes the address will respond. If no device responds, the access times out and the CPU receives a bus error. With bus grants, the electrically nearest device will receive the grant and pass it on to the next device if it didn't request bus access. I modeled this mechanism with a linked list. For all device specific behaviour there are virtual functions that correspond to unibus transactions. The PDP-11 has 8 general purpose registers and 8 addressing modes, that makes 6 bits to encode any register+mode combination. Some instructions have two operands (so 12 bits are needed to encode both), some have only one operand (6 bits), branch instructions have a signed 8 bit word offset, the other instructions have no operands. All double operand instructions first read the source operand and store it in temporary register R10, read the destination operand and store it in R11, execute the operation (they're all very simple ALU operations) and store the result back at the destination address, which was kept unchanged in the BA register. Unary instructions work almost the same, there just isn't a source operand. Branch operations add the branch offset depending on which status bits are set. The K11-A module is the extended arithmetic extension, it implements multiplication, division, logical and arithmetic shifts and normalization. The manual is very well written and I recommend anyone interested in how computers do math to read it. The way it works is that you set its AC and MQ registers by writing to their unibus addresses and then write a third value to another address to kick of the calculation. You then read back the result from AC and MQ from the same addresses. Implementation was rather straight forward, I simply transcribed the flow diagrams into C.
The TV hardware consists of essentially three parts: the bitmapped frame buffers, the video switch and the keyboard multiplexer. Luckily the TV code is very well commented so figuring out how they all work was not too hard even if a bit confusing. The setup has a maximum of 16 frame buffers. Each FB has a resolution of 576x454 pixels, with 16 pixels per word that makes 037730 PDP-11 words, almost 16kw. CREG (at 0164044) maps one of up to theoretically 256 FBs to 060000 on the Unibus and sets the ALU operation that is to be done on a write to the buffer memory. For faster changes to the FB the hardware can perform 16 different ALU operations itself instead of having the PDP-11 do them. Each of these 16 buffers are now fed into the inputs of the video switch that sends the video signal of every frame buffer to any number of TVs. The video switch is made up of two sections (S0 and S1 below), each having 16 inputs and 32 outputs. The corresponding outputs of both sections are mixed together to form the final signal for the TV. Since in the normal case you don't want to mix anything with the consoles, both sections have a null input on input 0, which leaves 15 inputs per section for the consoles. This shows how the 16 console frame buffers are fed into the video switch and how the output is mixed. The VSW register (at 0764060) controls the switch. For a section, input and output number it sets the source of the ouput of that section to the given input of the section. Thus every console can be displayed on every TV by setting the output of the section the buffer is connected to to that buffer and the same output on the other switch to 0. Up to 64 keyboards can be connected to the keyboard mux. It is controlled by the registers KMS (keyboard status, at 764050) and KMA (keyboard address, at 764052). When the multiplexer receives a key press from one of the keyboards, it will DMA it together with the keyboard number into a buffer in memory, the address of which is given by KMA. It will also interrupt the CPU so that it may read the new key and handle it. Implementing this in C is pretty straightforward. It gets a bit complicated by the way how the video switch works. Because every console buffer can be displayed on every display and also be mixed with another signal, it makes updating the TV client programs a bit more complex. Finally, here you can find source code: https://github.com/aap/pdp11 together some other PDP-11 emulation projects. The ITS build script automatically builds and starts it when ran with ./start tv11. You can then connect to the 11 with tvcon. The keyboard layout is modeled after the original layout, but there are command line options to make it a bit more pleasant.